Are you getting nothing but hot air from your vents? Your heater control valves (HCV's) are probably misbehaving, now a common failure. The HCV's are located at the left rear of the engine bay (driver side). The problem could be either mechanical (ex: defective internal seals) or electrical (ex: defective circuit boards). Troubleshooting this problem is straightforward, requiring only basic electric diagnostic skills and a multimeter. Once the fault is isolated, you can proceed with parts repair or replacement. My car had a faulty driver side (left) HCV which took almost a year to resolve (see this thread in BimmerForums). The following procedure and notes are based on this experience. It is written for the amateur do-it-yourselfer and therefore avoids circuit board analysis, and instead focuses on component replacement or repair. Furthermore, it assumes no wiring faults are present. Therefore, before replacing a component, you may want to test its respective wiring for continuity in order to be absolutely sure. TIP: Before beginning, I would suggest an IHKA (HVAC) fault code readout from your favorite indy mechanic or dealership. It's usually free. Why not utilize the diagnostic capability built into your 8-series? My car showed "left side heater valve". Info like this will help focus your troubleshooting. Heater Control Valve Troubleshooting - print quality diagram (PDF format). TEST 1 - Set your multimeter to test volts (DC). With both ignition and HVAC system "on", place one probe into connector pin1. Ground the other probe to the chassis (strut tower mounting bolts are convenient). The reading should be close to 12 volts (ex: 11.89). See note 1 below to address fault. TEST 2 - Set your multimeter to test resistance (ohms). With both ignition and HVAC system "on", place one probe into connector pin 2. Ground the other probe to the chassis (strut tower mounting bolts are convenient). The reading should be some varying non-infinite number. The actual value is not important - as long as it's not infinite. Repeat test for pin 3. See note 2 below to address fault(s). TEST 3 - This test is performed on the HCV unit itself, NOT the connector. You will need a 12 volt power source. I used the jumper points under the hood and jumper cables. I secured nails in the cable's jaws to serve as probes. Be careful not to touch the probes together! With 12 volts applied to HCV terminal 1, ground terminal 2. You should hear a "thunk" as the valve actuates. Repeat test for terminal 3. No "thunk"? See note 3 below. Otherwise, see note 4 below. Removing the front panel controller requires console trim removal and disassembly of the controller. An alternative which does not require controller disassembly is splicing wire 11 and 12 together. Lower trim removal on both driver and passenger side is required to access this "black box". It is secured by a plastic tab to the air box. Press tab in (rearward) and pull out from passenger side after disconnecting the four wiring harnesses (white/green - left, blue/yellow - right). A new module is cost prohibitive, if available at all. Source used parts from BimmerForums or eBay. Currently, prices range from $300-$400. NOTE 3 - Probable internal electric fault or broken valve. 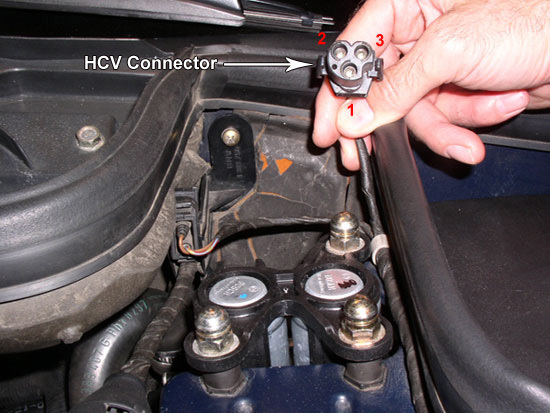 Replace HCV unit. Prices start around $180. HCV removal is facilitated by first removing the fresh air cowl at the rear of the engine bay. There is a small 7mm screw on each side which holds the cowl. Be sure to use a magnetic socket, or you will drop the screw in the bowels of the engine bay. Also, be careful when separating the water hoses from the HCV's attached auxiliary water pump as the plastic neck may crack. NOTE 4 - Probable faulty internal seals. Either rebuild or replace the HCV unit. Seal rebuild kits are available from Wokke on BimmerForums. See note 3 for tips on removal.